Most adolescents like to spend at least part of their free time playing video games. But for some, what starts out as innocent recreation can become an addiction. Soon, friends, family, school, and even personal hygiene are neglected as nearly every spare moment is spent playing the game. Which Games Are Most Addictive? Why Are Only Some Gamers Affected? But what makes a game addictive? Are there certain characteristics that make some games more addictive than others? Why are some teens more susceptible than others to this kind of addiction? Having a hard time getting your child away from the TV or computer? Read Why Won’t My Child Stop Playing Video Games? for help on weaning your child from games and the internet. As with any addiction, video game or “gaming” addiction is usually a multi-faceted issue. For starters, video games are designed to be addictive. Not “addictive” in the clinical sense of the word, but game designers are always looking for ways to make their games more interesting in order to increase the amount of time people spend playing them. This is particularly true for game developers whose business model relies on in-game purchases. As much as anyone, gaming designers themselves try to answer the question, “What makes a video game addictive?” They want you – once you log in or pick up that controller – to not want to stop playing. This doesn’t mean that game developers harbor the malicious intention of hooking a new generation of young people on video games. But what begins as an immersive escape can, for some, develop from a harmless form of entertainment into a more consuming addiction. Games that hook players are often designed to be just difficult enough to be truly challenging, while allowing players to achieve small accomplishments that compel them to keep playing. In that respect, the design of video games is similar to the design of gambling casinos, which will allow players to have small “wins” that keep them playing. Whether you’ve tried out the latest edition of Grand Theft Auto or haven’t played a video game since PacMan, the high score or completion percentage is one of the most easily recognizable hooks. Trying to beat the high score (even if the player is trying to beat his own score) can keep a player engrossed for hours. More and more gamers are competing with or against friends and other players from across the world via the internet. There are many permutations of online competitive gaming. Some games involve forming clans to compete against other groups of players while others use the last man standing “battle royale” format, most famously Fortnite. Here the goal may be to rise up the leaderboard or to gain bragging rights over friends. This “hook” isn’t used in online role-playing games but is found in nearly every gaming system. The desire to beat the game is fed as a player “levels up,” or finds the next hidden clue. Role-playing games allow players to do more than just play – they get to actually create the characters in the game and embark on an adventure that’s somewhat unique to that character. Consequently, there’s an emotional attachment to the character, and the story makes it much harder to stop playing. The exploration or discovery tactic is most often used in role-playing games. One of the most popular online games of all time is World of Warcraft, and a good portion of the game is spent exploring imaginary worlds. This thrill of discovery (even of places that don’t really exist) can be extremely compelling. Again, this is primarily an online “hook.” Online role-playing games allow people to build relationships with other players. For some kids, this online community becomes the place where they’re most accepted, which draws them back again and again. Individuals who suffer from bullying or struggle with face-to-face communication may be particularly vulnerable to withdrawing into an online world that seems less judgemental and anxiety-provoking than their real world. This is why strategies for overcoming gaming addiction must be sensitive to the wider context of the person’s life and circumstances if they are to stand a chance of success. Therapists with experience in treating gaming addiction know all too well that excessive gaming can co-occur with issues like depression, anxiety, and ADHD. Therefore, it’s vital to get to the core of the individual’s problems in order to find strategies that work. Massive Multiplayer Online Role-Playing Games (MMORPGs) can be especially addictive because there’s no “ending” in a classical sense. Unlike old-fashioned games like Super Mario Brothers, where you win when you save the princess, you can’t rescue the princess in an MMORPG. Indeed, even in online games that produce a clear victor by the end, it need only be a matter of seconds until the player joins the next game. Because each game presents a new challenge and new opponents, boredom is unlikely to set in as quickly as it would if you simply repeated the same scripted levels over and over. Another consideration is that some people are more prone to addiction of any kind than others, gaming or otherwise. Kids who are easily bored, have poor relationships with family members, feel like outcasts at school, or tend toward sensation-seeking are more easily drawn into video game addiction because it fills a void and satisfies needs that aren’t met elsewhere. In addition, it’s now believed that there may be a reinforcing element to addictive game playing. MRI studies, for instance, have shown that frequent gamers exhibit brain changes associated with increased dopamine release. Dopamine is a mood-regulating hormone associated with feelings of pleasure and similar changes have been observed in gambling addicts. 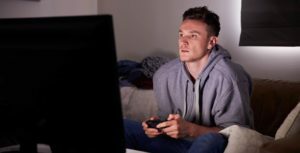 Though the debate rages on as to whether gaming addiction is a diagnosable disorder, problematic behavioral patterns undeniably exist for some. The combination of highly compelling gaming experiences created by designers and the predisposition some teens have to addictive behavior means this is a real issue that parents, teachers, and friends should be aware of and take action to prevent.